The Avengers Vol. 3 #38 (March 2001) Cover art by Alan Davis. The Avengers is a team of superheroes, appearing in comic books published by Marvel Comics. The team made its debut in The Avengers #1 (Sept. 1963), created by writer-editor Stan Lee and artist/co-plotter Jack Kirby, following the trend of super-hero teams after the success of DC Comics‘ Justice League of America. Labeled Earth’s Mightiest Heroes, the Avengers originally consisted of Iron Man,Ant-Man, the Wasp, Thor, and the Hulk. The original Captain America was discovered, trapped in ice (issue #4), and joined the group after they revived him. 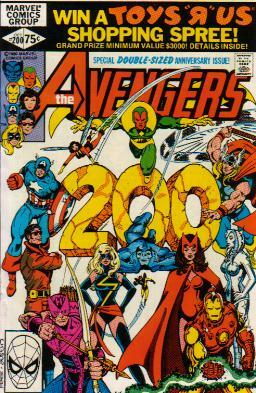 A rotating roster became a hallmark, although one theme remained consistent: the Avengers fight “the foes no single superhero can withstand.” The team, famous for its battle cry of “Avengers Assemble!”, has featured humans,mutants, robots, aliens, supernatural beings, and even former villains. The 2012 live-action feature film Marvel’s The Avengers, directed by Joss Whedon, set numerous records during its box office run, including the biggest opening debut in North America, with a weekend gross of $207.4 million. A second Avengers film is set for release on May 1, 2015. The team debuted in The Avengers #1 (Sept. 1963), using characters created primarily by writer-editor Stan Lee with penciller and co-plotter Jack Kirby. This initial series, published bi-monthly through issue #6 (July 1964) and monthly thereafter ran through issue #402 (Sept. 1996), with spinoffs including several annuals, miniseries and a giant-size quarterly sister series that ran briefly in the mid-1970s. Marvel filed for a trademark for “The Avengers” in 1967 and the United States Patent and Trademark Office issued the registration in 1970. Other spinoff series include West Coast Avengers, initially published as a four-issue miniseries in 1984, followed by a 102-issue series (Oct. 1985–Jan. 1994), retitled Avengers West Coast with #47; and the 40-issue Solo Avengers (Dec.1987–Jan. 1991), retitled Avengers Spotlight with #21. Between 1996 and 2004, Marvel relaunched the primary Avengers title three times. In 1996, the “Heroes Reborn” line, in which Marvel contracted outside companies to produce four titles, included a new volume of The Avengers. It took place in an alternate universe, with a revamped history unrelated to mainstream Marvel continuity. The Avengers vol. 2 was written by Rob Liefeld and penciled by Jim Valentino, and ran for 13 issues (Nov. 1996–Nov. 1997). 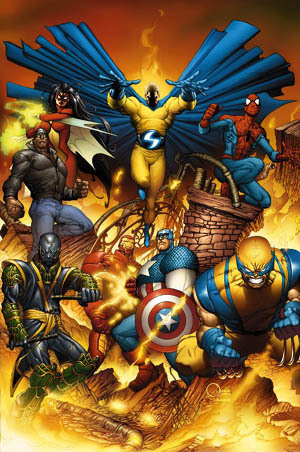 The final issue, which featured a crossover with the other Heroes Reborn titles, returned the characters to the main Marvel Universe. The Avengers vol. 3 relaunched and ran for 84 issues in February 1998 to August 2004. 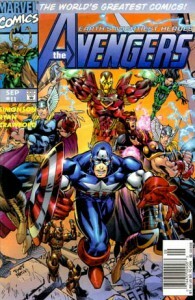 To coincide with what would have been, the 500th issue of the original series Marvel changed the numbering, and The Avengers #500-503 (Sept.– Dec. 2004), the one-shot Avengers Finale (Jan. 2005) became the “Avengers Disassembled” storyline and final issues. In January 2005, a new version of the team appeared in the ongoing title The New Avengers, followed by The Mighty Avengers, Avengers: The Initiative, and Dark Avengers. Avengers vol. 4 debuted in July 2010 and ran until January 2013. Vol. 5 was launched in February 2013. The first adventure featured the Asgardian god Loki seeking revenge against his brother Thor. Using an illusion, Loki tricked the Hulk into destroying a railroad track. He then diverted a radio call by Rick Jones for help to Thor, whom Loki hoped would battle the Hulk. Unknown to Loki, Ant-Man, the Wasp, and Iron Man also answered the radio call. After an initial misunderstanding, the heroes united and defeated Loki after Thor was lured away by an illusion of the Hulk and suspected Loki when he realized it was an illusion. Ant-Man stated that the five worked well together and suggested they form a combined team; the Wasp named the groupAvengers. The roster changed almost immediately; at the beginning of the second issue, Ant-Man became Giant-Man and at the end of the issue, the Hulk left once he realized how much the others feared his unstable personality. Feeling responsible, the Avengers attempted to locate and contain the Hulk, which subsequently led them into combat with Namor the Sub-Mariner. This resulted in the first major milestone in the Avengers’ history: the revival and return of Captain America. Captain America joined the team, and he was given “founding member” status in the Hulk’s place. The Avengers went on to fight foes such as Captain America’s wartime enemy Baron Zemo, who formed the Masters of Evil, Kang the Conqueror, Wonder Man, and Count Nefaria. The next milestone came when every member but Captain America resigned; they were replaced by three former villains: Hawkeye, the Scarlet Witch, and Quicksilver. Although they lacked the raw power of the original team, they proved their worth and fought and defeated Swordsman; the original Power Man; and Doctor Doom. Henry Pym (who changed his name to Goliath) and the Wasp rejoined the Avengers. Hercules became part of the team, while the Black Knight, and the Black Widow, didn’t obtain official membership status until years later. Spider-Man was offered membership in The Amazing Spider-Man Annual #3 (1966) but did not join the group. The Black Panther joined after rescuing the team from the Grim Reaper. The X-Men #45 (June 1968) featured a crossover with The Avengers #53 (June 1968). This was followed by the introduction of the Vision. Hank Pym assumed the new identity of Yellowjacket in issue #59, and married the Wasp the following month. The Avengers headquarters was in a New York City building called Avengers Mansion, courtesy of Tony Stark (Iron Man’s real identity). The mansion was serviced by Edwin Jarvis, the Avengers’ faithful butler, and furnished with state of the art technology and defense systems, and included the Avengers’ primary mode of transport: the five-engine Quinjet. The creative team of writer Roy Thomas and artist John Buscema introduced new characters such as Arkon in issue #75 (April 1970) and Red Wolf in #80 (Sept. 1970). The team’s adventures increased in scope as the team crossed into an alternate dimension and battled the Squadron Supreme, and fought in the Kree-Skrull War, an epic battle between the alien Kree and Skrull races and guest-starred the Kree hero, Captain Marvel. The Avengers briefly disband when Skrulls impersonating Captain America, Thor, and Iron Man used their authority as founders of the team and disbanded it. The true founding Avengers, minus the Wasp, reformed the team in response after complaints from Jarvis. Novelist Harlan Ellison plotted two stories for the series. The first (“The Summons of Psyklop”) was published in issue #88 (May 1971) and the second (“Five Dooms to Save Tomorrow”) in #101 (July 1972). Writer Steve Englehart introduced Mantis, who joined the team along with the reformed Swordsman. During the summer of 1973, Englehart and artists Bob Brown and Sal Buscema produced “The Avengers-Defenders Clash” storyline which crossed over between the two team titles. “The Celestial Madonna” arc linked Mantis’ origins to the very beginnings of the Kree-Skrull conflict in a time-spanning adventure involving Kang the Conqueror, and Immortus, who were past and future versions of each other. Mantis was revealed to be the Celestial Madonna, who was destined to give birth to a being that would save the universe. It was revealed that the Vision’s body had only been appropriated, and not created by Ultron, and that it originally belonged to the 1940s Human Torch. With his origins clear to him, the Vision proposed to the Scarlet Witch. The “Celestial Madonna” saga ended with their wedding, presided over by Immortus. The Beast and Moondragon joined the team soon after. George Pérez became the title’s artist with issue #141 (Nov. 1975) which saw the start of a seven-part story featuring the Squadron Supreme and the Serpent Crown. After Englehart departed and a seven-issue stint by Gerry Conway, Jim Shooter began as writer, generating several classic adventures, including “The Bride of Ultron,” the “Nefaria Trilogy,” and “The Korvac Saga”, which featured nearly every Avenger who joined the team up to that point. Shooter introduced the character of Henry Peter Gyrich, the Avengers’ liaison to the United States National Security Council. Gyrich was prejudiced against superhumans and acted in a heavy-handed, obstructive manner, and insisted that the Avengers followed government rules and regulations or else lose their priority status with the government. Among Gyrich’s demands was that the active roster be trimmed down to only seven members, and that the Falcon, an African American, be admitted to the team to comply with affirmative action laws. This last act was resented by Hawkeye, who because of the seven-member limit lost his membership slot to the Falcon. The Falcon, in turn, was unhappy to be the beneficiary of what he perceived to be tokenism, and decided to resign from the team, after which Wonder Man rejoined. The true origins of Quicksilver and the Scarlet Witch were revealed in a three-part story that ran in issues #185-187 (July-Sept. 1979). After this adventure, the Scarlet Witch took a leave of absence and Ms. Marvel officially joined the team as her replacement. The Avengers #200 (Oct. 1980). Cover art by George Pérez and Terry Austin. The first major development was the breakdown of Henry Pym, with his frequent changes of costume and name being symptomatic of an identity problem and an inferiority complex. After he abused his wife, failed to win back the confidence of the Avengers with a ruse and was duped by the villain Egghead, Pym was jailed. Writer Roger Stern resolved this by having Pym outwit Egghead and defeated the latest incarnation of the Masters of Evil single-handedly, and proved his innocence. Pym reconciled with the Wasp, but they decided to remain apart. Pym retired from super-heroics, but returned years later. Stern developed several major storylines, such as “Ultimate Vision” in which the Vision took over the world’s computer systems in a misguided attempt to create world peace; the formation of the West Coast Avengers; and “Avengers Under Siege” which involved the second Baron Zemo and the Masters of Evil taking over the mansion and severely injured Jarvis and Hercules. “Assault on Olympus” featured Hercules’ father, Zeus, blaming the Avengers for his son’s injuries and brought them to Olympus for trial, and the “Heavy Metal” arc saw the Super Adaptoid organized several robotic villains for an assault on the team. New members during the 1980s included Tigra; the She-Hulk; an African American Captain Marvel named Monica Rambeau; Starfox; Hawkeye’s wife, Mockingbird; and Namor, while Henry Pym emerged from retirement to join the West Coast Avengers. Spider-Man was again offered membership, but failed to gain admission due to security concerns by the Avengers’ government liaison. Rogue, who would later become a member of the X-Men, was introduced inThe Avengers Annual #10 (1981) by writer Chris Claremont and artist Michael Golden. Stern created the villain, Nebula, who falsely claimed to be the granddaughter of Thanos. The team relocated for a period to a floating island off the coast of New York called Hydrobase. The Avengers moved their base of operations to Hydrobase after Avengers Mansion was severely damaged in the “Under Siege.” Hydrobase was later sunk during the Acts of Vengeancecrossover. Following Stern’s departure, Walt Simonson wrote the series briefly but left due to editorial conflicts. John Byrne took over writing both West Coast Avengers and The Avengers and revamped the comics to allow members to be active when available and reserved when not available and merged the two separate Avengers teams into one team with two bases. Byrne’s contributions included a revamping of the Vision, and the discovery that the children of the Scarlet Witch and the Vision were actually illusions. The loss of the Scarlet Witch’s children and the Vision, who was disassembled by government agents in retaliation for the Ultimate Vision storyline, drove her insane, although she eventually recovered and rejoined the team. This story revealed that the Scarlet Witch’s powers included wide-range reality manipulation and she was what the time-traveling Immortus refers to as a “nexus being” setting the stage for 2004’s eventual Chaos and Avengers Disassembled storylines. This played out in the Darker than Scarlet storyline which ran in Avengers West Coast from issues #51–62 (Nov. 1989–Sept. 1990). The Avengers titles in late 1989 were involved in the major crossover event “Acts of Vengeance” where Loki assembled many of Marvel’s arch-villains, his inner circle consisted of Doctor Doom, Magneto, Kingpin, Mandarin, Wizard, and Red Skull, in a plot to destroy the team. Loki orchestrated a mass breakout of villains from prison facility, the Vault, as part of his “Acts of Vengeance” scheme, but he ultimately failed in his goal to destroy the Avengers. The Avengers vol. 2, #11 (Sept. 1997), showing the Heroes Reborn Avengers. Cover art by Michael Ryan and Sal Regla. In 1990, the U.S. government revoked the Avengers’ New York State charter in a treaty with the Soviet Union. The Avengers then received a charter from the United Nations and the Avengers split into two teams with a substitute reserve team backing up the main teams. Bob Harras and Steve Epting took over the title in the summer of 1991 and introduced a stable lineup with ongoing story lines and character development focused on the Black Knight, Sersi,Crystal, Hercules, the Vision, and the Black Widow. Their primary antagonists in this run were the mysterious Proctor and his team of other-dimensional Avengers known as the Gatherers. During this period, the Avengers found themselves facing increasingly murderous enemies and were forced to question their rule against killing. This culminated in “Operation: Galactic Storm,” a 19-part storyline that ran through all Avengers-related titles and showcased a conflict between the Kree and the Shi’ar Empire. The team split when Iron Man and several dissidents executed the Supreme Intelligence against the wishes of Captain America. After a vote disbanded the West Coast Avengers, Iron Man formed a proactive and aggressive team called Force Works. During the team’s first mission, Wonder Man was killed again, though his atoms were temporarily scattered. Force Works later disbanded after it was revealed that Iron Man became a murderer via the manipulations of the villain Kang. During the Heroes Reborn event, many of the Avengers together with the Fantastic Four and others, died trying to stop the psychic entity Onslaught, although it was revealed that Franklin Richards preserved those heroes in a pocket universe. Believed the main team to be gone, the Black Widow disbanded the Avengers, and only butler Jarvis remained to tend to the Mansion. Marvel contracted out The Avengers and three related titles — Captain America, Fantastic Four, and Iron Man to former Marvel artists Jim Lee and Rob Liefeld, two of the founding creators of Image Comics. The previous continuity of the Marvel Universe was set aside as the heroes were “reborn” in the pocket universe. While The Avengers was relaunched as a new series, the “Heroes Reborn” line ended after a year as planned and the license reverted to Marvel. 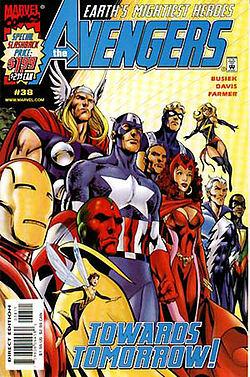 Writer Kurt Busiek and penciler George Pérez launched a new volume of the series with The Avengers vol. 3, #1 (Feb. 1998). Busiek concurrently wrote the limited series Avengers Forever, a time-travel story that explored the history of the Avengers and resolved many outstanding questions. New members during this run included the revived Wonder Man, Justice, Firestar, Silverclaw, and Triathlon. Busiek’s run included many of the Avengers’ traditional villains such as the Grim Reaper, Ultron, Count Nefaria, and Kang the Conqueror. Variant cover art for New Avengers #1 (Feb. 2005), by Joe Quesada and Richard Isanove. 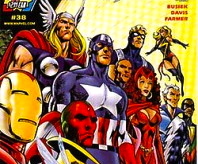 Successor writer Geoff Johns dealt with the aftermath of Busiek’s Kang arc, as the Avengers were granted international authority by the United Nations. Members joined during that period included Jack of Hearts and the second Ant-Man. Chuck Austen followed as writer, and added a new Captain Britain to the team. Writer Brian Michael Bendis then rebooted the title with the “Avengers Disassembled” storyline. Titled Chaos, the story featured the deaths of some members and a loss of credibility for the team. The culprit is revealed to be the Scarlet Witch, who had gone insane after agonizing over the memory of her lost children and who subsequently lost control of her reality-altering powers. With the team in disarray and Avengers Mansion ruined, the surviving members agreed to disband. A new Avengers team soon formed, coming together as the result of a massive jailbreak at The Raft prison facility. This New Avengers lineup was composed of Iron Man, Captain America, Luke Cage, Wolverine, Ronin, Spider-Man, Spider-Woman, and the Sentry. This was soon followed by the House of M event. In the company-wide “Civil War” story arc, Marvel superheroes were split over compliance with the U.S. government’s new Superhuman Registration Act which required all super-powered persons to register their true identities with the federal government and become agents of same. The New Avengers disbanded, with a rebel underground opposed to the act formed in a series retaining The New Avengers in its trademarked cover logo and New Avengers in its copy writtenindicia. Luke Cage led this underground Avengers team in that series. The team consisted of himself, Echo, Ronin, Spider-Man, Spider-Woman, Wolverine, Iron Fist, and Doctor Strange. During the long-term Secret Invasion by the shape-shifting alien race the Skrulls, Spider-Woman had been abducted and replaced by the Skrull queen Veranke. After the Skrulls’ defeat, Spider-Woman was rescued along with other abducted and replaced heroes. During the company-wide story arc “Dark Reign“, Echo and Iron Fist left the team and the Avengers gained Ms. Marvel, Bucky as Captain America, and Mockingbird. In response to the Civil War, Iron Man formed The Mighty Avengers under the aegis of the government’s Fifty State Initiative program, and took up residency in New York City joined by Ares, the Black Widow, the Sentry, the Wasp, Wonder Man, and leader Carol Danvers as Ms. Marvel. After the events of “Secret Invasion“, Norman Osborn assumed control of the formerly S.H.I.E.L.D.-sponsored Avengers, now under the auspices of his own agency, H.A.M.M.E.R. All but Ares and the Sentry left this team (except for the Wasp, who had appeared to have died in the Secret Invasion) as it was taken over by Norman Osborn and the team migrated to the Dark Avengers book. Osborn recruits Marvel Boy to pose as Captain Marvel and Daken to pose as his father, Wolverine, bringing Moonstone, Bullseye, and Venom from his previous Thunderbolts team to impersonate Ms. Marvel, Hawkeye, and Spider-Man, respectively. In the pages of The Mighty Avengers, Hank Pym, assumed the Wasp identity of his fallen ex-wife, led a new team of Avengers, and claimed the name for his team as he was the only founding Avenger on any of the three active Avengers rosters. His team operated under a multi-national umbrella group called the Global Reaction Agency for Mysterious Paranormal Activity (GRAMPA). This team featured the roster of Hercules, Amadeus Cho, Stature, the Vision, Jocasta, U.S. Agent, Quicksilver, and Pym himself. Loki in disguise as the Scarlet Witch was a recurring character. Iron Man and the Hulk were briefly with them during their battle with Chthon. The “Heroic Age” roster of the Avengers. 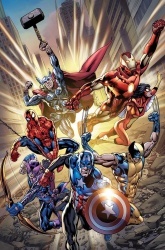 Cover art forAvengers vol. 4, #12.1, by Bryan Hitch. After the conclusion of the “Siege” story arc, which ended the “Dark Reign” storyline, all four of the then-current Avengers series (The Mighty Avengers, New Avengers, Dark Avengers, andAvengers: The Initiative) were canceled, and a new ongoing series titled Avengers was launched in May 2010. Brian Michael Bendis and John Romita, Jr., serve as regular writer and artist respectively. The full Avengers roster was revealed in issue #1 as: Thor, Hawkeye, Spider-Man, Wolverine, Captain America, Spider-Woman, Iron Man, and team leader Maria Hill. At the start of the Heroic Age storyline, the New Avengers became an officially recognized team given independence from Stark’s more traditional Avengers by Captain Steve Rogers, primarily due to Cage’s distrust of a government backed superhero group. Captain America left the team to solely serve the main Avengers, Iron Fist rejoined the team, and Power Woman and the Thing were added to the roster. Steve Rogers had an occasional presence and Victoria Hand was added with his backing, which caused controversy among the other members due to her previous ties to Norman Osborn. A second series titled Secret Avengers was released in May 2010, written by Ed Brubaker with Mike Deodato as the regular artist. The second volume of the New Avengers series was relaunched in June 2010, written by Bendis and drawn by Stuart Immonen. A fourth title called Avengers Academy was launched in June 2010, it replaced Avengers: The Initiative. Christos Gage served as writer, with Mike McKone as artist. During an international meeting between Steve Rogers and MI-13, Captain Britain was offered a job with the Avengers. Captain Britain accepted despite mixed reactions from his MI-13 teammates. Noh-Varr was asked to help the Avengers by building a time machine to save the future. After that crisis was over, Noh-Varr was officially invited to join the Avengers. Bruce Banner made arrangements with Steve Rogers for the Red Hulk to join the Avengers, and he assists the team in tracking down the Hood as the villain had begun to search for the Infinity Gems to serve as a new ‘power source’. The combined strength of the Avengers, New Avengers, and Secret Avengers was enough to repel the Hood..
After the events of “Fear Itself“, the “Shattered Heroes” storyline led to several changes in the main Avengers team lineup, with Quake and Storm being recruited, and the Vision re-joining the team after being rebuilt by Iron Man. Wolverine and Spider-Man leave the main team, and become more involved in their membership with the New Avengers. During the events of the Avengers vs. X-Men storyline, Storm quits the team to side with her fellow mutants as a member of the X-Men. After seeing how insane that Cyclops and the other Phoenix-powered X-Men were becoming, she later switches sides to the Avengers but never officially rejoins the main team. Additionally, Noh-Varr betrays the team and sets out to capture the Phoenix Force due to his loyalty to the Kree Empire. However, upon learning of the Kree’s plan for the Phoenix Force, he comes to his senses. Despite this, the Avengers felt betrayed and subsequently abandon him. Following Avengers vs. X-Men, a new series titled Uncanny Avengers debuted in the flagship title of Marvel NOW!. The title is written by Rick Remender with art by John Cassaday, and the team contains members of both the Avengers and the X-Men. A new bi-weekly Avengers title was launched written by Jonathan Hickman and drawn by different artists for each story arc. Hickman is also writing New Avengers, featuring two dozen characters between the two titles. The first story arc dealt with Captain America leading the Avengers to Mars to counter a powerful being called Ex Nihilo, who intended to destroy and remake life in the universe. The Avengers then fought against Nightmask and Starbrand during the White Event, the two are imprisoned on Stark’s Sol’s Hammer weapon after Starbrand destroyed the living consciousness of Earth.